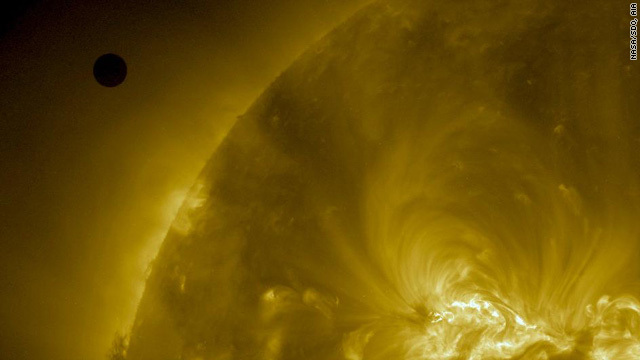 "This image from NASA's Solar Dynamics Observatory shows Venus as it nears the disk of the sun on June 5, 2012. Venus's 2012 transit will be the last such event until 2117." One thing wrong with this picture the sun ray would have made a dish of thin line of light on both side of Venus. The USG has a Starship in space at this moment, don't believe what the media and USG is telling you that the USG has no such starship. China and Russians are already in space exploring the stars, do you really believe they not? it was unfortunate that i missed it,i watched for it and when it happened i was celebrating an aunt's birthday. Thank you for posting such images and congratulations to those who got to witness. such an awesome event to have witnessed!